Valentine’s Day is nigh, which means that some of you are likely to receive a new piece of jewelry this week! A while back, I got a request to do a roundup of jewelry storage options and I figured this was a good time to do that. 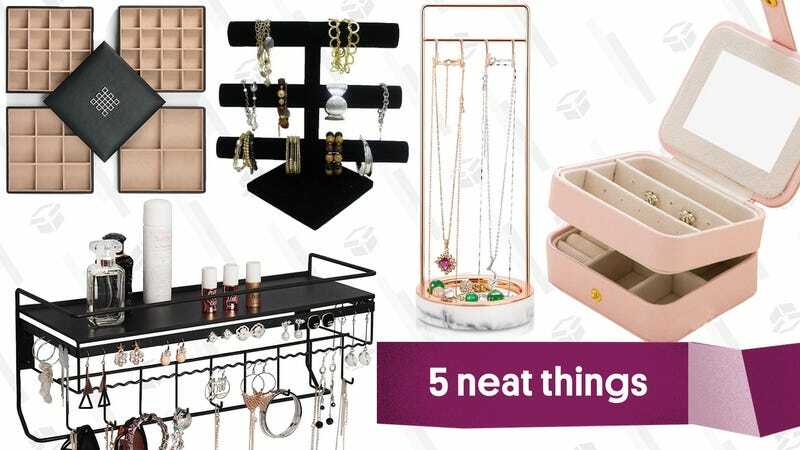 While there are loads and loads of jewelry storage options out there, there are also a lot of alternatives to traditional jewelry boxes and that’s I’ve got for you today. Do you have an unusual way you store jewelry that works for you? Let us know in the comments! 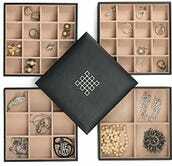 Jewelry organizing trays offer a bit more flexibility over traditional jewelry boxes. This version has 45 compartments in different sizes to accommodate earrings, necklaces, bracelets, etc, of different sizes and construction. While some jewelry trays are open, this one has a lid with a mirror — SIDEBAR: Does anyone ever actually use the mirror inside of jewelry boxes?? — which many of you will prefer because it creates a tidier appearance. The exterior is covered in leather, and compartments are lined with velvet to protect jewelry from scratching. 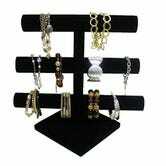 I’m a bracelet and hoops girl, and I picked up one of these velvet-covered T-bar-style jewelry organizers recently. GAME CHANGER. It’s not as annoying as you’d think to slide a few bracelets off in order to get to the one you want but, pro tip that’s kind of obvious but also well worth stating: put the bracelets (or hoops) you wear most often on the outer edges of the bar so you can get to them most easily. This type of stand can also be used for storing necklaces and headbands. If you’re a necklace girl (or guy! Or genderfree! No need for us to be gender essentialist about this, hell I saw a dog in a giant gold chain the other day, jewelry transcends species!) a tree stand-style jewelry holder is a good way to stash your collection. Firstly, it helps to keep delicate chains from getting tangled up while not in use. Then, it also lets you see your things so you’re less likely to get stuck in a jewelry rut in which you only ever wear the same one necklace ever. 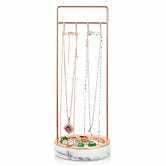 It has four hooks for hanging necklaces, and a lipped tray at the base for stashing trinkets like small rings or stud earrings. Jewelry cases for travel aren’t the most practical choice — a jewelry roll packs better and takes up less room at home when you’re ready to store it — but a small case can perform double duty by letting you store your accessories in it at home and then just, like, close/lock it up and toss it in your suitcase before you head out of town. This style offers you your choice of light blue, pink, white or navy faux leather, and is fitted with two compartments. 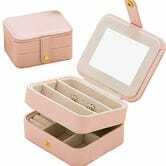 The top section has three rows for storing earrings and necklaces, and the bottom compartment has rolls for rings, plus a four-corner compartment. If surface space is in short supply, a wall-mounted jewelry organizer will let you take advantage of unused vertical space. This style is going to be best for someone who has a smaller collection of jewelry, otherwise you’ll have to take, like, 10 necklaces off to get to the one you want. But, there’s room for 20 earrings, plus 9 hooks for hanging necklaces, bracelets, hoops, etc. and a bar that can hold several pairs of sunglasses. A shelf on top can be used for stashing small items like bottles of nail polish or hand cream.